: Companion, watch- and guard dog. : Mrs. C. Seidler, revised by Mrs R. Sporre-Willes, E. Peper and C. Bailey / Official version DE. : As forerunners of the present day Great Dane, one must look at the old “Bullenbeisser” (Bulldog) as well as the « Hatz-and Saurüden » (Hunting and wild boar hounds), which were midway between the strong Mastiff of English type and the fast, handy Greyhound. The term Dogge was at first understood to mean a large, powerful dog, not of any particular breed. Later, particular names such as Ulmer Dogge, English Dogge, Great Dane, Hatzrüde (Hunting Dog), Saupacker (boarfinder) and Grosse Dogge (Great Dogge), classified these dogs according to colour and size. 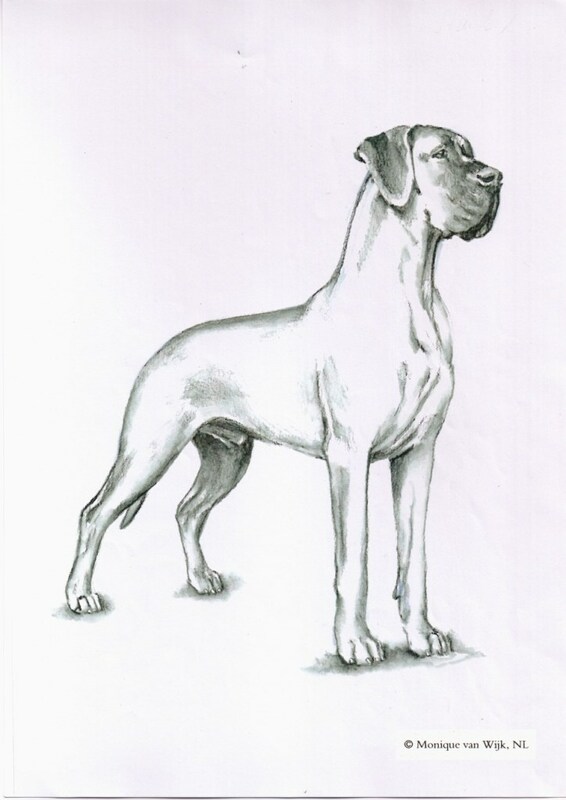 In the year 1878 a Committee of seven was formed in Berlin, consisting of active breeders and judges with Dr. Bodinus in the chair, which made the decision to classify all the forenamed varieties as “Deutsche Doggen” (Great Danes). Thus the foundation was laid for the breeding of a separate German breed. In the year 1880, on the occasion of a show in Berlin, the first standard for the Deutsche Dogge was laid down. This standard has been taken care of since the year 1888 by the “Deutsche Doggen Club 1888 e.V.” (German Doggen Club, registered Club 1888) and frequently been revised over the years. The present Standard meets the requirements of the F.C.I. : The Great Dane in his noble appearance combines a large, powerful well constructed body with pride, strength and elegance. By substance together with nobility, harmonious appearance, well proportioned outlines, as well as an especially expressive head, the Great Dane strikes the onlooker as a noble statue, never coarse or with refined elegance. Perfect in balance and always with clearly defined sexual dimorphism. He is the Apollo amongst all breeds. : Almost square in build, this applies particularly to males. Females can be a little longer in body. : Friendly, loving and devoted to his owners. Might be reserved towards strangers, but required is a confident, fearless, easily tractable, docile companion and family dog with high resistance to provocation and without aggression. : In harmony with the general appearance. Long, narrow, distinct and expressive. Never wedge shaped. Finely chiselled, especially under the eyes. The distance from tip of nose to stop and from stop to the slightly defined occipital bone should be as equal as possible. The upper lines of muzzle and skull should definitely run parallel. The head must appear narrow seen from the front with bridge of nose as broad as possible. : Superciliary ridges well developed but not protruding. : Well developed, more broad than round with large nostrils. Must be black with the exception of harlequins (white with black patches). In these a black nose is desired but a butterfly nose (black with pink patches) or flesh coloured nose is tolerated. In blue dogs the colour of the nose is anthracite (diluted black). : Deep and as rectangular as possible. Bridge of nose must never be concave (dish shaped), convex (roman nose) or falling away in front part (eagle nose). : Well defined corners of lips. Lips neither lacking flews nor being too pendulous or rolled in. Dark pigmented lips. In harlequins not totally pigmented or flesh coloured lips are tolerated. : Well developed broad jaws. Strong sound and complete scissor bite (42 teeth according to the dentition formula). Any deviation from a complete scissors bite (except for PM1s in lower jaw) is highly undesirable. : Cheek muscles only slightly defined and in no way protruding. : Of medium size with lively friendly intelligent expression. Almond shaped with close fitting lids. Eyes not set too wide apart or slit eyes. As dark as possible, light piercing or amber coloured eyes are undesirable. Although in blue dogs slightly lighter eyes are tolerated. In harlequins pale (ice blue) eyes or two differently coloured eyes are to be tolerated. : Naturally pendant set on high, but not lifted above skull or hanging low. Medium sized. Front edges lying close to cheeks but neither hanging flat nor standing off from sides of head. : Long, clean, muscular and never short or thick. Well formed set on, tapering slightly towards the head, with arched neckline. Carried upright but inclined slightly forward, but no ewe neck. Throatiness or dewlap is highly undesirable. : The highest point of the strong body. It is formed by the points of the shoulder blades which extend beyond the spinal processes. : Short and firm, in almost straight line falling away imperceptibly to the rear. Back never to be long or with top line rising towards the rear. : Slightly arched, broad, strongly muscled. : Broad, well muscled. Sloping slightly from hipbone to tail set, imperceptibly merging into the tail set. Croup must never fall away steeply or be completely flat. : Reaching to the elbows. Well sprung ribs, reaching far back. Ribs must never be barrel shaped or flat. Chest of good width and depth and must never look flat sided or shallow. Well marked fore-chest, although breastbone must not be too strongly pronounced. : Belly well tucked up towards rear, forming a nicely curved line with the underside of the brisket. It is not desirable that females retain a slack belly line after maternal duties. : Reaching to the hocks, must not be too long or too short. Set on high and broad, neither too high nor too low. Not too thick, tapering evenly towards tip. In repose tail is hanging down with natural curve. When the dog is alert or moving the tail is carried slightly sabre-like but not markedly above the backline, must never be carried above the back line. Hook tail or curled tail as well as a tail carried sideways are highly undesirable. Bristle hair on tail undesirable. : Must be sufficiently angulated and with strong bone and muscles. : Strongly muscled. The long, slanting shoulder blade forms an angle of 100 to 110 degrees with the upper arm. : Strong and muscular, close fitting should be slightly longer than the shoulder blade. : Turned neither in nor out. : Strong, muscular. Seen from front and side, completely straight with vertical stance. : Strong, firm, only slightly standing out from the structure of the forearm. : Strong, straight when seen from the front, seen from the side, barely slanting forwards. : Rounded, well arched, well-knit toes (cat feet). Nails short, strong and as dark as possible. : Rounded, well arched, well-knit (cat feet). Nails short, strong and as dark as possible. : The whole skeleton is covered by strong muscles which make the croup, hips and upper thighs appear broad and rounded. The strong well angulated hind legs, viewed from behind, are parallel to the front legs. : Long, broad, very muscular. : Strong, positioned almost vertically under the hip joint. : Long, of approximately the same length as the upper thigh. Well muscled. : Strong, firm, turning neither in nor out. : Short, strong, standing almost vertical to the ground. : Harmonious, lithe, covering a lot of ground, slightly springy. Never with a short stride or pacing. Legs must be parallel in movement, both coming and going and always well co-ordinated between front and rear. : Tight fitting. In solid colours, well pigmented. In harlequins, the distribution of pigment mainly corresponds to the markings. : Very short, dense, smooth and close lying, glossy. Must never be coarse, dull or a double coat. The Great Dane is bred in three separate colour varieties Fawn and brindle, harlequin and black, and blue. Fawn: Light gold fawn to deep gold fawn. Black mask desired. Never to be grey fawn, blue fawn or a sooty fawn colour No white markings. Brindle: Basic colour, light to deep gold fawn with black stripes as regular and clearly defined as possible, running with the direction of the ribs. Black mask desired. Never with washed-out streaks. No white markings. Harlequin: (white with black splashed patches): Basic colour pure white, preferably with no ticking. Pure black patches well distributed all over the body, having the appearance of being torn. Grey or brownish patches or nuances of those colours in the black are undesirable as well as blue-grey ticking in the white. So called “Grautiger” occur, they are neither desirable nor to be disqualified. Black: Jet black, white markings on chest and feet permitted. Included here are “Manteltiger” in which the black covers the body like a coat (“mantel”) or blanket and muzzle, throat, chest, belly, legs and tip of tail may be white. Also dogs with basic white colour and large black patches so called “Plattenhunde”. The black colour must never have nuances of fawn or brown or bluish black colour. Blue: Pure steel blue, white markings on chest and feet permitted. Never with a fawn nuance or blackish blue colour. Males at least 80 cms, should not exceed 90 cms. Females at least 72 cms, should not exceed 84 cms. Rolled in lip (the lower lip is pinched between the incisives of upper and lower jaw). Irregular position of individual incisors as long as the bite remains correct, teeth too small. Partial pincer bite. Eyes protruding or too deeply set. Shoulders that are loose or loaded or with upright shoulder blades. Carpus bent, enlarged, or knuckling over. Pasterns which are markedly weak, too sloping or too upright. Hindquarters with too much or too little angulations. Hock joints that are open, enlarged or unstable. Cow hocked as well as rear pasterns too close together. Dewclaws. Apple head and too prominent cheek muscles. Slack eye lids and showing red haw. Tail which is damaged thickened at the tip or which has been docked. Liver coloured or split nose. Bite that is overshot, undershot or a wry mouth, pincer bite, missing teeth apart from two P1 in the lower jaw. Wall eyes or differently coloured eyes in all solid colours, except in harlequins. Tail with kink (i.e. deformed vertebrae). Silver blue or isabella colour in fawns and brindles. Fawn, brindle or blue dogs with white as blaze, collar, socks or on tip of tail. Miscoloured harlequins brindle or blue patches (‘porcelain tiger’), white with fawn.